The macula is the central area of one of the most important parts of your eye ? the retina. 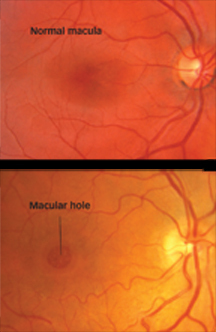 Cross-sectional image of macular hole. Note the missing piece of macula floating in the vitreous. In the lower picture, note the round area of retinal tissue, missing in the center of the macula.
? ?How does a macular hole form? Your eye is filled with a gel-like substance called vitreous, which lies in front of the macula. As you age, the vitreous gel shrinks and pulls away from the macula, usually with no negative effect on your sight. In some cases, however, the vitreous gel sticks to the macula and is unable to pull away. As a result, the macular tissue stretches. After several weeks or months the macula tears, forming a hole. Less common causes of macular holes include injury and long-term swelling of the macula. It is important to note that if the macula is damaged, you will not lose your vision entirely. You will still have peripheral, or side, vision. Vitrectomy surgery is the most effective treatment to repair a macular hole and possibly improve vision. The surgery involves using tiny instruments to remove the vitreous gel that is pulling on the macula. The eye is then filled with a special gas bubble to help flatten the macular hole and hold it in place while it heals. You must maintain a constant face-down position after surgery to keep the gas bubble in contact with the macula. This can range from a few days to a few weeks, depending on your surgeon?s ?recommendation. A successful result often depends on how well this position is maintained. The bubble will then slowly dissolve on its own.